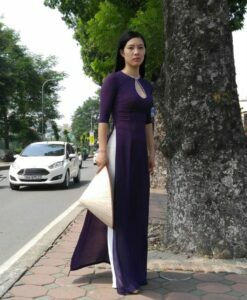 Ao Yem is a traditional Vietnamese bodice used primarily as an undergarment that was once worn by Vietnamese women for the decades. Due to the limitation in shipping time, we may not able to wash your Ao Yem before shipment. There may have the chalk marks on your dress. Also, for transportation needs, the dress that you’ve received will have a fold phenomenon. Please don’t worry, this fold situation will disappear after the first time washing and hang it on. Ironing is not recommended. Please remember do not use a washing machine to wash your Ao Yem. Washing must be by hand with cool or warm water under 35 Celcius.